Handcrafted in the Canary Islands (Spain). 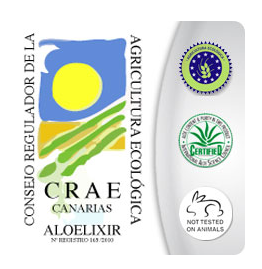 99.7% Pure Aloe Vera Gel, cold pressed, from organic Aloe Vera plantations on the Canary Islands. Throughout history, Aloe Vera has been used in skin and hair care, as well as a treatment of many diseases. Currently, Aloe Vera is contained in a huge number of beauty products, but many of these products have insufficient amounts of Aloe Vera, to cause the desired effect. In Aloe Vera Luxury we extract pure Aloe Vera pulp (Aloe Barbadensis Miller) directly from its leaves. We cold press the pure fresh pulp, in order to preserve all its properties. Through this method we will finally obtain a product that is 99.7% of pure Aloe Vera juice, with all its nutrients inside. Aloe Vera has more than 75 beneficial substances for our body, such as vitamins, minerals, anthraquinones, monosaccharides, polysaccharides, enzymes, plant sterols and 20 of the 21 essential amino acids. In addition, plants grown on the Canary Islands develop a lot more properties. Due to its warm and stable climate, its proximity to the sea and its volcanic soil, the Canary Islands are considered a paradise for cultivating high quality Aloe Vera. Accordingly, the Aloe Vera plants grown on the Canary Islands are considered the best quality Aloe Vera in the world, showing 3 times more acemannan than the plants grown in other regions. Several cosmetologists have already recognized that the use of Aloe Vera provides good results in the treatment of many skin conditions, as it penetrates easily the epidermis, dermis and hypodermis, which are the three layers of skin, to expel the bacteria and fatty deposits from the pores. The nutrients and minerals contained inside the plant increase the healing effect that the Aloe vera has on all skin conditions, including rosacea, acne and psoriasis. The vitamins and amino acids encourage and enable the reproduction of new cells, regeneration and hydration. Consequently, Aloe Vera pulp is considered to be the best natural cellular regenerator. There is enough clinical evidence to show that Aloe Vera has powerful healing properties. But it is not only a good remedy for treating burns, its also used in the treatment of topical ulcers, superficial wounds, gangrene, atopic dermatitis, allergies, skin spots, herpes, eczema, psoriasis, insect bites, etc. Aloe vera is also a good fungicide helping people with athlete's foot and other fungi. It also produces effective results against respiratory diseases such as tuberculosis, bronchitis, asthma, flu and nasal congestion. 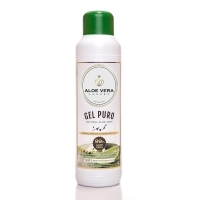 Pure Aloe Vera gel is highly anti-inflammatory, making it great for treating haemorrhoids. And finally, Aloe Vera is a powerful astringent; it helps with problems of excess fat, acne and seborrheic alopecia. Apply the pure gel in the morning and / or evening. It can be applied on body or face. For people over 30, we recommend to mix Aloe Vera with a natural moisturizer, because as it is astringent, you can have sensation of dryness. In addition, combined with a moisturizer, it will help to improve the penetration of the moisturizer in the skin. Prior to application, the skin should be clean and dry. You don’t need to rinse it once applied. You can apply Aloe Vera before make-up, combined with your daily cream or with any ointment you want to use. Aloe Vera won’t interfere with any medicine applied onto the skin; on the contrary, it helps the medicine to penetrate skin better and faster. People of any age and pregnant women can use pure Aloe Vera gel. This product contains 99.7 % Pure Aloe Vera Juice, cold pressed and extracted directly from its leaves. It´s recommended storing this product in the fridge once opened. This will avoid an early oxidation of the product. It will last 6 months in the fridge, once opened. NOTE: Aloe Vera is a lily, so it shares family with garlics, onions and tulips. Consequently, the smell of the pure pulp may be a bit strong. However, once applied to the skin, the odour will disappear completely in less than 2 minutes, as it is absorbed 4 times faster than water. In addition, after 6 months, the colour of the gel will start to turn yellow. This is the normal oxidation process of the plant, therefore, you can continue using it until the product turns orange or till it reaches 12 months.